Ivan Barbashev and Zach Sanford both scored in the Blues' 3-1 win over the Golden Knights on Monday. ST. LOUIS — The St. Louis Blues paid a big price to obtain Ryan O’Reilly, but it’s already looking like a bargain. 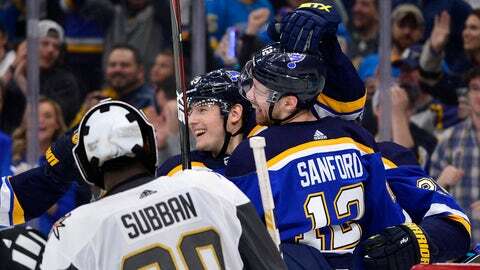 St. Louis acquired O’Reilly from the Buffalo Sabres last offseason for Tage Thompson, Vladimir Sobotka and Patrik Berglund, a 2019 first-round draft pick and a 2021 second-round pick. Jay Bouwmeester was called for slashing at 13:14 and the Golden Knights capitalized. Karlsson scored with two seconds left on the power play when he put in a rebound of Colin Miller’s shot at 15:12.